I don’t know about you guys, but I am just not ready for summer to end. So I am holding on to every last bit of it for as long as I possibly can! That means fresh and bright flavors on my plate all day long. I’m well aware that Fall is just around the corner and pumpkin recipes are already starting to pop up. But I’m just not ready yet! I want the berries, the peaches, the greenest of vegetables – I want it all! And as you know, I’ve also been finding some beautiful peaches at the farmer’s market on the weekends, so I’ve been eating them like it’s my job! (Wait, can that be my job?) Some people may be sick of peaches by now, but talk to me in December.. you’ll be missing those peaches! So eat them up while you can! That’s where these fish tacos come into play. Remember that peach tomato salsa I made the other day? Yeah, that was for these tacos! And what a combination it made! They are fresh, light and using summer’s best ingredients to the fullest! The tilapia in this recipe is very simply seasoned with salt and pepper and sauteed in a skillet. I squeezed a little bit of lime juice on them as they came off the pan. Other than that these tacos are quite simple: Just chop up some fresh purple cabbage, add a few pieces of fish, top with some peach tomato salsa and maybe some avocado (because avocado makes everything better right?). Twenty minutes tops and dinner is served! What’s your favorite summer ingredient that you know you’ll be missing this winter? 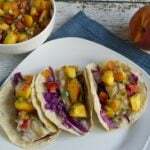 These tilapia fish tacos with peach salsa make a quick summertime weeknight meal. On the table in less than an hour, you'll love the combination of this peach salsa with the fish. Gluten-free and dairy-free. Preheat a skillet over medium heat. Add oil. Season tilapia filets with a sprinkle of salt and pepper on both sides. Once the oil is warm, add two of the tilapia filets and cook about 4 minutes on each side, until fish flakes easily with a fork. Repeat with the remaining fish. Heat up your tortillas. Add shredded cabbage to the taco. Top with fish (about 1 filet for 3 tacos) and spoon peach tomato salsa over the fish. If you are using diced avocado or guacamole, add it over the salsa. I heat my tortillas in the oven at 350F for about 5 minutes until they start to puff up. You can also do this in a skillet over the stove or in the microwave (though they won't puff up). Heating the tortillas makes them a little toastier, crunchier and more pliable. Meaning they won't fall apart on you. These are extremely colorful and gorgeous. I imagine these would taste amazing! Love me some peach; personally I’ll be missing strawberries. Thank you so much Leisel! I’m a big fan of colorful recipes! I’m definitely going to be missing strawberries too! I love when they’re in season! Thank you! I LOVE fish tacos! Thanks for stopping by! Oh my gosh. I love fish tacos, they’re perfect for the end of summer. Delish! I love tacos! I’ve never tried heating up my tortillas though. Will definitely have to do that next time! Hi Sean! Flounder would definitely works and would be delicious! Try cooking the flounder for about the same amount of time as the tilapia in the recipe. Let me know how it tastes!